Barbecue season. The only time my cravings for meat really ever come back. And the reason this vegan potato salad was born. I think the main reason for my craving is the terrible quality of the veggie and vegan sausages or burgers available. In my (humble) opinion they all taste like old boots, and if they don’t have the consistency of cardboard then they’re almost guaranteed to involve egg – and who knows where that egg came from? A chicken presumably, but not a happy one I’m sure. Most companies don’t even bother to write ‘egg sourced from organic/free range chickens’ or similar, and that’s really not a good sign. I even gave in to a burger at a BBQ last year (it was being thrown away anyway, I decided better in my belly than the bin) and it was awful. It’s how this vegan potato salad came to be. Where am I going with this? Well, now the key to a good BBQ for me involves all sorts of meat-free side dishes. Potato salad is an all-time classic, and meat eater or not, it’s a hard push to beat a BBQ that comes with potato salad. The fact it’s vegan is a bonus. 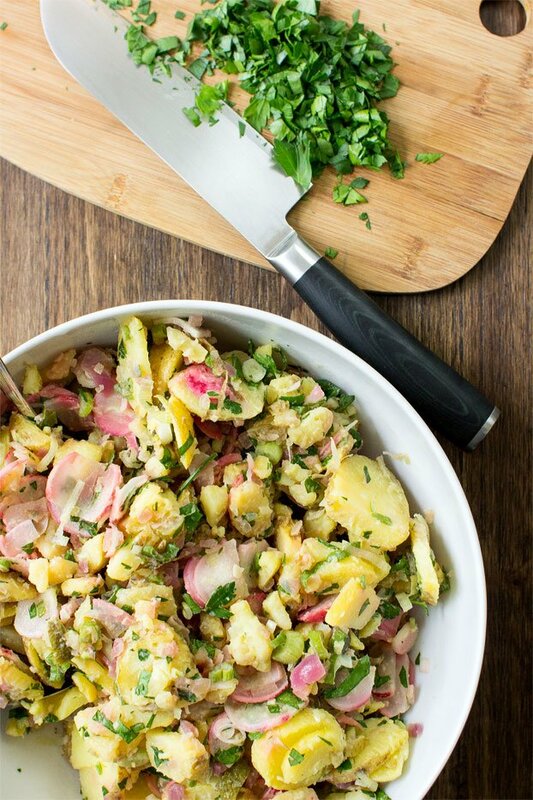 This potato salad is there to put my (and possibly your) cravings to an end. After telling our new professional chef of my BBQ dilemmas, he introduced me to this wonderful dish. South German in style (well, without the beef broth), it’s fresh and tangy with a sweet offset that hits just the right spot. 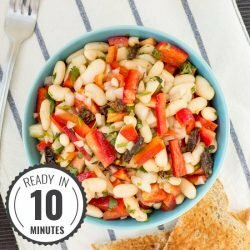 It doesn’t use any oil (or mayo either, obviously) so it’s a perfect light dish if you’re looking to keep the calories a little lower over summer. 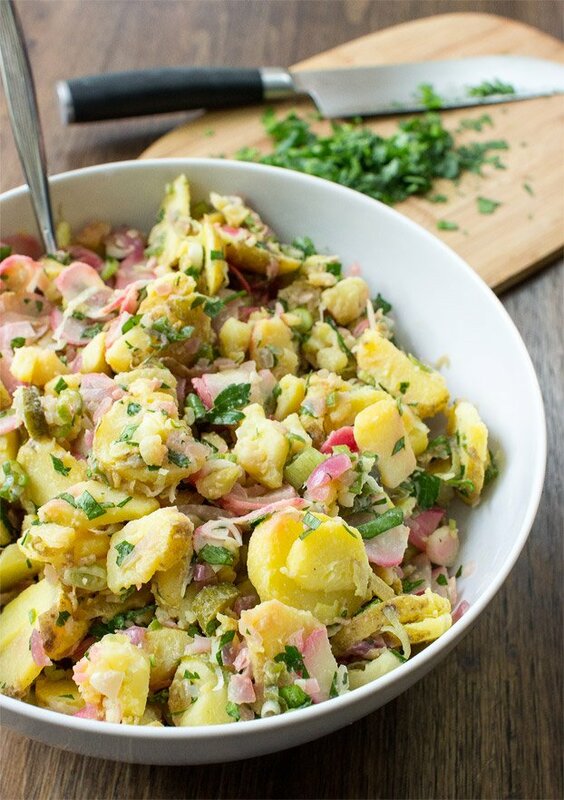 There are a couple of things you can do to make your vegan potato salad EVEN better. ‘Oversalt’ the potatoes while boiling – the potatoes need a lot of salt to get full flavour out of them. 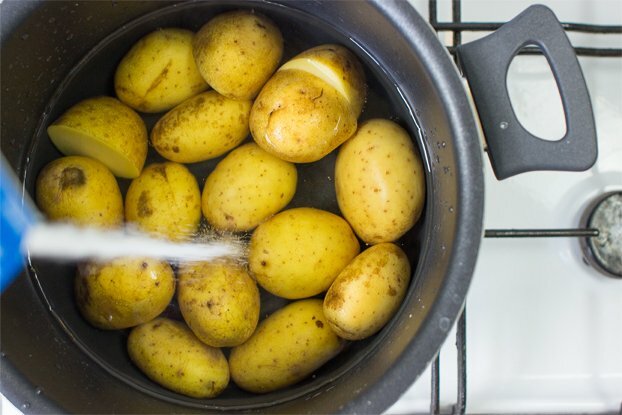 Make sure you taste the potatoes after boiling: then you will know how much salt you need to add to the dressing. Remember to season the salad while it’s still warm, it will soak up the taste way better than when it’s cold. This applies to almost everything in cooking – a great tip to take with you. 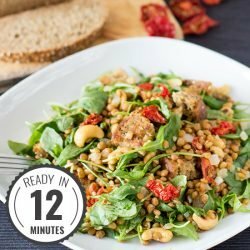 The salad will taste even better on the second day, so this is something you can prepare one or two days ahead (and save time when you need it). So there you go. 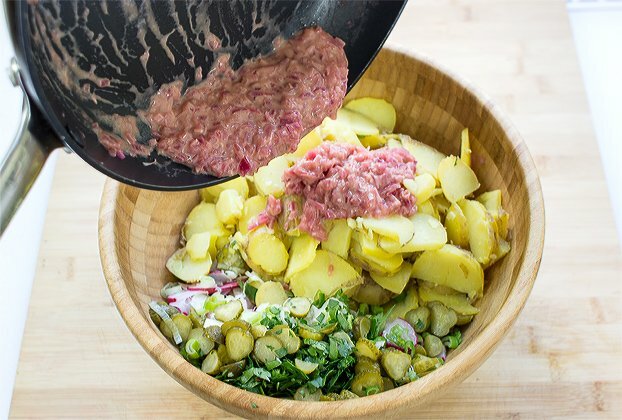 Reinvigorate your barbecues with some proper potato salad – you’ll never miss meat again. Thanks for sharing the recipe, Jansen! 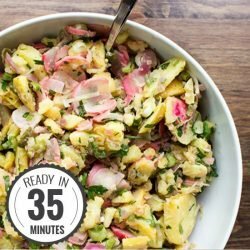 Damn Delicious Vegan Potato Salad - take your BBQ to the next level without oil or mayo in this delicious animal friendly classic. Boil the potatoes in salty water. If you don’t add enough salt the potatoes will taste like nothing. After 15 minutes check if they are done by pinching them with a fork. If it’s easy to pierce through they’re done. For the dressing: dice the onion, grate the garlic and put it into a small pot. Add vinegar and water and let it simmer it until the onions are tender. Once the onions are tender add agave syrup, mustard and salt. You will get some crumbles and offcuts from the potatoes. Put this into the dressing because this will bind nicely. 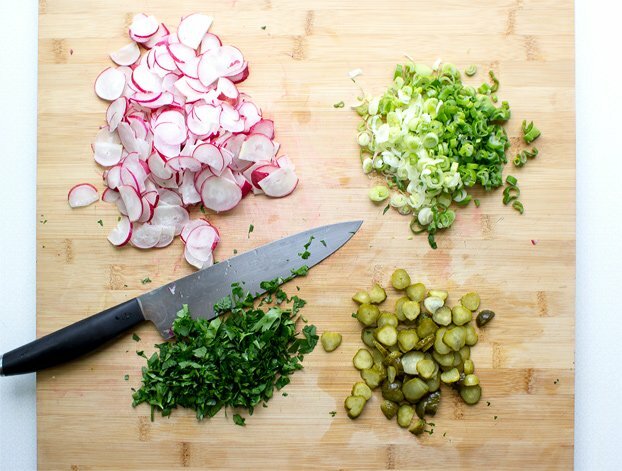 Finely slice the radish, chop the spring onions, pickles and parsley. Now assemble everything in a salad bowl. Mix well, taste test and if necessary add more salt to your liking. Sounds like a great vegan version of a classic potato salad! Love the dressing! YUM! Have to give it a try! Just noticed you have a blog too, need to check it out, wait, click, now! 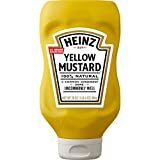 Question – do you mean ground mustard or prepared mustard? First try was tasty but I was just wondering. Glad you liked the first try already! question- when you add the vinegar and water to the garlic and onion – when you say let it simmer do you mean to cook or to stand? just checking as simmer usually means to cook but because this is a salad i wondered if you meant to stand/soak? forgot to ask – do you keep the vinegar/water liquid once the onions have softened? What kind of pickles did you use? Basically regular pickled cucumbers that in a vinegar water mix. I don’t know where things went wrong, but I’m making a huge batch and the vinegar/water to onion ratio is really off! I’m left with a ton of liquid! Oh dear! That doesn’t sound good. I’ll take a look at the ratio the next time I make a bigger batch. I imagine with such a large batch the water hasn’t had enough time to evaporate. What’s left is still to be used as dressing for the salad (but of course you don’t want it swimming in it!). If it’s still too much I suggest using a spatula to hold the onion as you tip away some of the excess liquid. I hope that helps a little, Edy! I made this but substituted capers (1/4 C) for the pickles. Delicious. Thank you! I detest radishes; is there another ingredient I could substitute? I’m gonna go leftfield here Susan – how about turnips? IMO they would definitely be worth a try. Or kohlrabi, if you can find them! I’m in the US and am wondering about vegetable names. I think the “spring onions” in this recipe are what we in the US call “scallions” or “green onions” To show you what I mean, here’s the web address of a page that has a photo. (Sorry–you’ll have to paste it in your browser because I couldn’t figure out how to insert a link or photo): http://www.cor.ca/view/330/scallion.html. Iis that right? 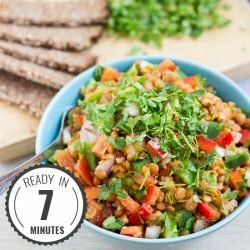 So glad to find your site as my daughter is vegan and I’m still learning how to cook for her! 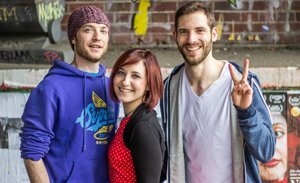 Hi Beth, and welcome! Great to have you here, and glad you’re finding it useful for your daughter! So, from looking, yes green onions are definitely those type of scallion. 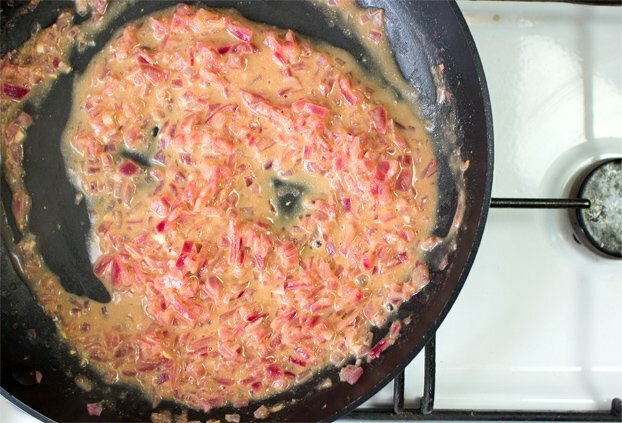 A red onion is just that – I don’t think it’s quick the same as the red shallot. ‘Small’ is more to give indicator of size, really. I guess half a ‘normal’ red onion would be appropriate too. Unless I’m way off – do you have regular red onions in your area? 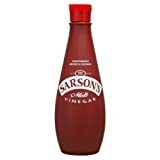 Does it matter which type of vinegar? If it’s not specified then I usually assume it means plain white vinegar. But when I click on the link it takes me to Malt Vinegar. How would this be with balsamic vinegar instead? Sweeter I’m sure, but wondering if it would still go with everything else…? Aldi recently put potatoes on sale for just $1.49 for 10 pounds. For a big family of vegans, 30# of potatoes isn’t too many, right? So, I’ve been making potatoes in a huge variety of ways! I made your potato salad and loved it! My kids are eating it by the bowlful! I followed your directions except that I didn’t saute the onion and I added some finely chopped red pepper. I like that satisfying crunch. I also added just 2 Tbsp of tahini and stirred it in at the end. The addition of radishes was brilliant! Very nice bits of spicy goodness! Thanks! It’s definitely on my “make again” list!